And just who is that adorable toddler? 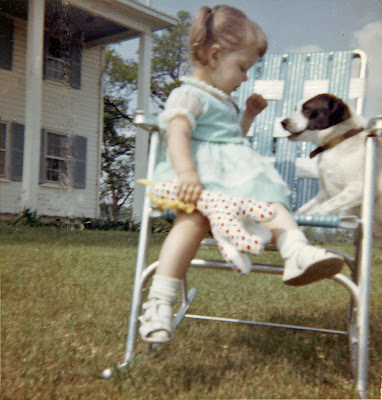 Why, that's the Food Lady herself with my first dog. It kinda looks like I'm teaching Sissy to speak. More likely I was hoping not to get my tender little digits nipped by the little terrier. It's all how you interpret it, I guess. When was this taken, you ask? Well, let's just say somewhere after the Beatles hit U.S. soil but before space travel became more than a dream. After I showed this photo to a dear friend, she noted that my personal sense of style was my hallmark even then. It's not everyone she says, that can rock the socks with sandals look. Thanks, Nora! One of the rare times that I'll actually post a photo of myself here. The camera is a contrary beast and isn't very kind to me lately.